What is TRX2 Thickening & Styling Cream? 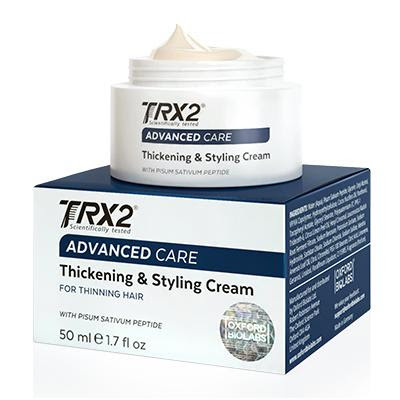 TRX2® Advanced Care Hair Thickening & Styling Cream is designed for instant volume and locked-in moisture. Pisum Sativum Peptide is the newest and most bio-available vegetable protein on the market. It is also the main active component of the rich naturally-based formula of TRX2® Advanced Care Thickening and Styling Cream. Acting at a molecular level, it boosts volume and locks in moisture to immediately enhance the look of the hair. Clinically proven results show that hair, being covered with this styling innovation, becomes visibly thicker and noticeably more hydrated, while retaining its natural movement and bounce, which is never stiff or crispy. This product will be released in April 2017, but is already available to pre-order. This interesting product is a different take on the hair loss product, and compliments their existing line of hair health products. Logically speaking, anti-hair styling creams are actually deemed ineffective for treating baldness and thinning hair. Normal topical treatments like serums or foams are effective because they absorb into the scalp upon application. Hair styling products only cover the hair strands, and do not absorb into the scalp, therefore they are not effective in preventing hair loss, regardless of how potent the actually formula is. If you are seeking a topical solution to treat baldness, then you should not rely on a hair styling cream.